Like most people know, selling a home is not simply cut and dry. There are endless factors that go into the successful sale of a home, from the blatantly obvious price point to the lesser-known curb appeal. But in the end, there are five crucial factors affecting home sales that can either help, or destroy, a deal. 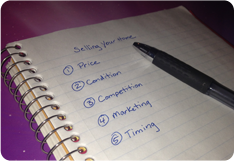 Pricing your home correctly is key. Many sellers want to price their home at what they paid for it or what they think it is worth. In reality, this could lead to months, even years, of sitting on the market and a rude awakening. In order to sell your home fast, hiring a realtor will allow your house to be priced realistically. A professional realtor knows that the selling price of your home is actually based on similar homes in your area that sold within the last 6 months. This will create an accurate picture of what your home can sell for, not what you think it should sell for. Keeping your home in top condition is a huge factor affecting home sales. Buyers want to see a clean, airy, and welcoming home, not one in dire need of a good washing. The majority of people looking to buy a home want something move-in ready, and any repairs you have neglected could turn off these buyers. So when selling your home, spend the up-front costs to make your home shine, as in the end, it could net you more money, especially in this seller-dominated market. Take note of your competition. This comes back to pricing and home condition. If your home is overpriced and in poor showing condition compared to another home, your competition already has an edge up on you. If there are several homes in your area, similar to yours and at roughly the same price point, do everything you can to make your home stand out to buyers; this can include anything from fresh paint to instant curb appeal. With our real estate market still recovering, even the tiniest factor affecting home sales is important to keep in mind. Marketing your home to potential buyers is the first step to getting people through your doors. The best way to approach this is to hire a realtor. They have access to services you may not and this can help sell your home faster. Realtors are experts when it comes to marketing your home and can allow hundreds more people to see it. The final, but equally as important, factor affecting home sales is timing. There are a few sub-factors that contribute to this. For example, do not put your house on the market when buyers will not be actively looking, like during the holidays. Also keep an eye on mortgage rates and market strength. Times with lower mortgage rates allow buyers with good credit more opportunities. Your realtor will be aware of this and can help factor your area’s mortgage rates into your homes pricing strategy.